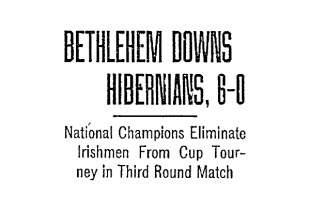 The journey to the third round of the 1915-1916 edition of the National Challenge Cup tournament, known today as the U.S. Open Cup, had begun easily for reigning champions Bethlehem Steel and Philadelphia’s Hibernian club in the first round, with Bethlehem defeating Blue Mountain League side Bethlehem East Ends, 9-0, and Hibs crushing Allied American first division side Peabody, 15-0. It was in the second round that things started getting tricky. Meanwhile, Hibernian drew with 2-2 with Allied American first division side Viscose of Marcus Hook when they first met in second round play on December 11. Meeting again on Christmas Day for the replay, the teams played to a 3-3 draw in a match that was a wild, back-and-forth affair. In their third second-round meeting on New Year’s Day 1916, Hibernian finally advanced thanks to a muddy 4-1 win at Potter’s Grounds at Front Street and Erie Avenue. When Bethlehem and Hibernian commenced play on January 15, muddy conditions weren’t the issue, it was the zero degree temperature and a frozen field. Nevertheless, the Globe reported on January 16 the East End Field grounds were “in good condition” and some one-thousand spectators were on hand despite the cold. Play was, as the Inquirer described in their January 16 match report, “of the rush-kick style, the ball being difficult to control on account of the hard frozen ground.” Still, Bethlehem was the aggressor and almost scored in their first attack. A series of corner kicks from the home team followed, but Hibernian was able to hold firm. Soon, Fleming scored his second goal of the day, this time from the penalty spot after a handball in the box. The score was then 4-0 in Bethlehem’s favor when center forward Pepper finished the rebound of a shot from inside right McKelvey that had struck the crossbar. McKelvey wrote his name on the scoring sheet when he headed home a corner kick from Fleming. Brown then scored his second goal of the day just before the final whistle to make Bethlehem Steel the 6-0 winners. In the end, the home team had 30 shots on goal, winning 11 corner kicks, compared to 9 shots from Hibernian and 2 corner kicks. It was the visitors’ third loss to Bethlehem of the season. With the win, Bethlehem advanced to the quarterfinals, where they would face West Hudson on April 2.